In an effort to preview the other ten teams in the Big Ten, I’m going to be conducting a series of interviews with other Big Ten hoops bloggers. We are going to kick it off with everyone’s favorite, Wisconsin and Bo Ryan’s swing offense. Hoops Marinara is one of the best Wisconsin hoops blogs around and Phil agreed to jump in and break down the Badgers. Fans around the Big Ten are probably celebrating the fact that Joe Krabbenhoft has graduated, any other key departures? Wisconsin lost two solid four-year “glue guys” in Krabbenhoft and Marcus Landry that contributed to much of Bo Ryan’s recent success in Madison. Krabby and Old Man Landry will be missed most of all for their versatility, defense and unselfishness. Krabbenhoft may have been detested around the league, but he was tough. Landry was an undersized warrior who had turned into a good outside shooter. On the flip side, it can be argued that neither Landry nor Krabbenhoft really seemed to live up to expectations as they got older. Former walk-on Kevin Gullikson also graduated, taking with him some frontcourt depth, a lot of hustle and the anchor leg of any pitcher race. Who’s expected to fill the gaps? What’s your predicted starting lineup? Everyone is expecting an all-upperclassmen starting five from Bo Ryan. The senior backcourt will be Trevon Hughes at point and Jason Bohannon as the shooter. Both Keaton Nankivil (6’8″) and Jon Leuer (6’10”) spent time in the starting lineup last season as sophomores, but neither is a true center. Fellow junior Tim Jarmusz (6’7) will man the small forward spot to start the year. Wisconsin must get more out of their reserves than they did last season, when the bench minutes ranked in the bottom fifth of all Division I. Stealing? Are there any other freshmen of note in Wisconsin’s incoming class? 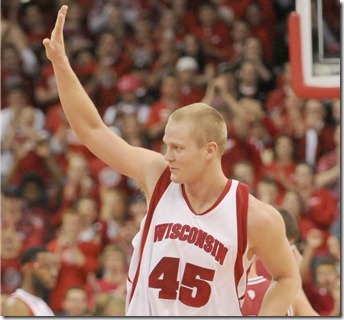 After the smoke cleared from the campus burglary shocker, the Badgers wound up with only one new scholarship athlete on the squad this season: carrot-topped Mike Bruesewitz. At 6’7″ he has the potential to be Krabbenhoft 2.0: a Big Ten-ready package of toughness, rebounding, and ball handling ability. I expect Bruesewitz to crack the rotation. However, two redshirts from last season, Jared Berggren and Ryan Evans, join Bruesewitz in the unlikely freshman class. The 6’10” Beggren, a former RSCI Top 100 recruit from Minnesota, is the real wild card and has gathered the most buzz in the offseason. What are the expectations for this year’s Badger team? Wisconsin is always at the top of the Big Ten but there are some very talented teams in the conference. Fans expect another tournament team that can surprise some people by gliding under radar. Wisconsin returns two senior guards who hit free throws and a legitimate backup floor leader in sophomore Jordan Taylor, so you will see even more three-guard lineups. 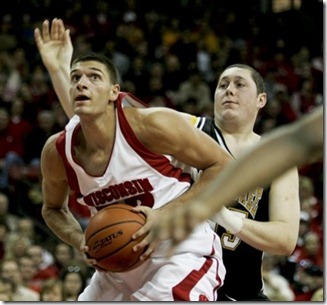 Someone in the frontcourt must make the proverbial “leap” in order for the Badgers to become truly dangerous though. Berggren is going to be counted on as the first big off the bench. It will be exciting to see how the plethora of other inexperienced bench players develop since three to four underclassmen will be fighting for the final spots in Bo’s tight rotation. Everyone knows Trevon Hughes, who is a guy off the radar who turns into a big time player this year? People know about Leuer so I will go with Nankivil. An ankle injury right after Nankivil’s breakout 21-point display against Purdue ended his run as a starter, but the broad-shouldered forward has shown he can score when given minutes. Nankivil often thinks too much on the court, which hurts his rebounding among other things. I think you’ll see more aggressiveness and tenacity from him as a junior. Any big non-conference games on the slate? Pre-season tournaments? Two marquee events highlight the early schedule. Wisconsin squares off against Arizona to start the Maui Invitational around Thanksgiving. Other possible opponents include Gonzaga, Vanderbilt and Maryland. Upon returning home, the Badgers host Duke on Dec. 2 in the Big Ten/ACC Challenge. Huge chance there to erase an ugly 2007 memory. Most feared player in the Big Ten? The guy who ruined Wisconsin a couple of times last season was Minnesota’s Lawrence Westbrook, who thanks to some poor Badger defense, single-handedly turned two Wisconsin wins into losses. But the guy I actually fear the most is Manny Harris. He can clean the glass, dish and parade to the charity stripe. Wisconsin does as good a job checking him as anyone (career: 12 ppg, 35% FG), but he is still the obvious choice here. That’s the true compliment to his ability to explode at any time. Predicted record (and conference record) for Wisconsin? Looking at the schedule I see another NCAA Tournament team. Even though the Big Ten will be even better, I think the Badgers can duplicate last year’s 10-8 mark, heading into the conference tourney at 20-10 overall. Wisconsin has a roster full of relatively unknown commodities, but are very talented nonetheless. The two biggest questions facing the 2009 Badgers are can they defend and will they be able to close out opponents in the final minutes. Those two elements eluded them last year and they still made the tournament. If that trend continues this year, Wisconsin won’t be able to keep up in the conference race.